The Bundestag. And it’s new spirally mirrory thing. The Bundestag sits on the western edge of Berlin, and is now the official home of the German parliament (again). Back when it was named the Reichstag, a fire in 1933 was one of the events Hitler used as pretext to sieze power. Seems pretty suspicious to me. “Guten tag Herr Hitler. Wie geht’s?” “Ja, sehr gutt, und du?” “Oh mein gott, was ist das? 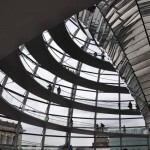 Das Reichstag ist “… what’s German for ‘on fire’? “…geblazen.” (???) And while they were all distracted putting it out, Hitler seized power, eh? Fitting that it’s the same way he left the world then. Actually, that whole paragraph was just so I could show off how good my German has got in just 3 days here. Four years of studying it, and I still can’t hold a conversation beyond “Ja, sehr gutt. Und du?” Even shopping is useless I can go into any bakery and ask, “Ich mochte ein butterbrot, bitte”. Except I don’t want the damn sandwich. I want the cake. Ich mochte cake. So anyway, that’s kind of how Hitler came to power. It was properly restored from 1990-1999 or so which also saw a new dome erected on top which houses a central funnel of mirrors and two separate spiral walkways towards the top of the dome. It is without a doubt, really, really cool, and well worth the hours wait in the rain I queued to get in. Can someone check for me – I can’t be bothered to research for my own blog, but – was he involved in the Mayors building on South Bank, too? Probably not, but the design reminds me of that anyway. Kuchen! That´s the one 🙂 Ich esse kuchen.